KARL SCHNELL presents the latest generation of its filling machine-portioning device KS Diaphragm Type 329 for the processing of paste-like materials of all types. Individual applications in the food industry demand the highest flexibility and accuracy from filling machines and their downstream portioning and forming devices. The new KS Diaphragm Type 329 achieves these requirements ideally. 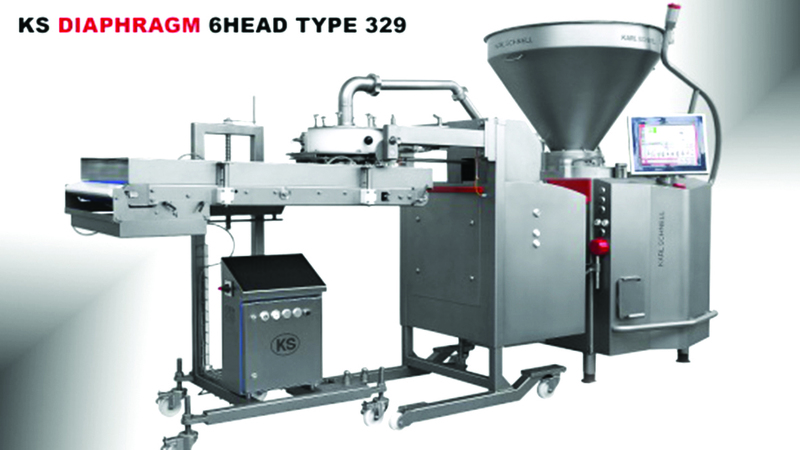 The high-performance vacuum filler KS P10 SE Type 588 provides an even, gentle on the product and need-based supply of the downstream portioning and forming device and thereby lays the foundation for optimum process reliability. The specialists of KARL SCHNELL are going in new directions when implementing the adjustment configuration for portioning and forming operations. The KS Diaphragm Type 329 is appealing due to its newly developed drive concept based on a highly dynamic servo motor. The specification of the shape and the size of the product to be processed is solely through parameter setting in the control. This is accomplished easily and without difficult on the large touch screen of the filling machine. Irritating and costly mechanical settings on the portioning and forming device are no longer required. That means there is also no additional set-up when changing a product. 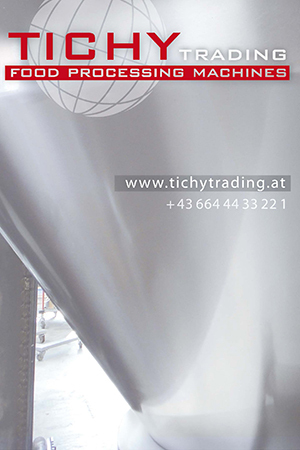 All parameters are saved in the product-specific program in the filling machine and can be selected easily due to visual options. Of course an adaptation of the production parameters and the correction of the shapes are possible at any time during operations. Thus, any changes become visible immediately. The electromotive height adjustment of the complete diaphragm unit for the easy comfortable positioning above a cooking bath or a transportation belt is another advantage. 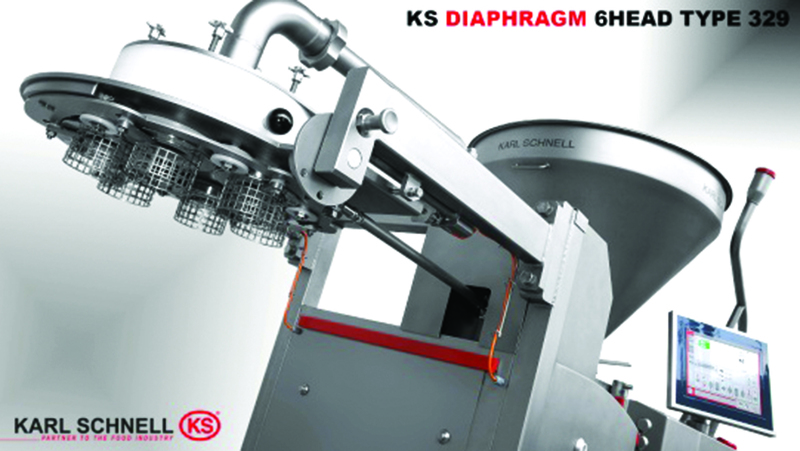 The KS Diaphragm Type 329 can be obtained in different versions with 1 to 6 portioning heads.